Seven years ago, Johnnie Gentry, director of the University of Arkansas herbarium and professor of biological sciences in the J. William Fulbright College of Arts and Sciences, got in his old blue and brown Ford van with 95,000 miles on it and drove to universities and colleges throughout Arkansas on a quest to enlist help for an ambitious project he envisioned: to catalog every plant in the state. The project was built on sweat equity, as the collectors worked in teams of two, collecting the plants in two-gallon plastic Ziploc bags, writing field notes, and pressing plants. They drove up to six hours to reach a site, and then often worked 12 to 15 hours a day for four days at a time. Before starting at daylight, they studied relief maps, noting the location of ravines, wetlands, glades and woodlands. During the hot Arkansas summers, they would be wringing wet by 10 a.m. For aquatic specimens, they sometimes had to wade through stagnant, swampy water up to their armpits to collect the plants. To Gentry and his fellow scientists, this was fun. The final count: Arkansas is host to 191 families, 924 genera, and 2,704 species of plants. Of those species, 621, or around 21 percent, have been introduced from other states or countries. 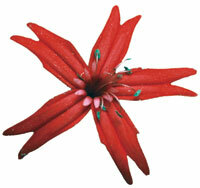 Some are introduced by people who plant seeds bought elsewhere, by bird droppings or by gardeners planting new hybrids. The Japanese honeysuckle is such a plant. Aggressive and invasive, it has become the most widespread, common plant in the Southeastern United States. The beef-steak plant from Asia has invaded two-thirds of Arkansas counties. The leaves can be eaten, while the seeds produce oil used for cooking and medicine. However, the mature plants are extremely toxic to cattle, and if they get into baled hay, become a real threat to farmers. For years, many were baffled by their dying cattle until they found out about the toxicity of the beef-steak plant. The Arkansas Flora Project is widely supported throughout the state, with funding or research assistance from nine universities as well as the Arkansas Natural Heritage Commission, the Ouachita National Forest, the Arkansas Game and Fish Commission, and the Arkansas Native Plant Society. Gentry, who worked closely with George Johnson at Arkansas Tech University during the project, will oversee production of a fully illustrated manual, probably from 800 to 1,000 pages, describing all the plants. He expects the manual to be published in 2014. Gentry and UA students Sarah Nunn, Sarah Jacobs, and Marisa Williams also have identified Arkansas flora that are either antibacterial or anticancer agents. Since 1959, scientists in the U.S. have examined more than 180,000 plants in their search for extracts that elicit anti-tumor activity. Patented treatments such as Taxol and Taxotere are derived from the Pacific and English yew, while Velban, Oncovin, and Fildesin come from compounds found in Madagascar periwinkle, a commonly cultivated plant. “Because of their diversity, Arkansas flora are certain to contain excellent candidates for anti-cancer drugs,” says Gentry. He explains that the diversity is in part driven by the unique location of the state, its proximity to the Mississippi river placing Arkansas in the ecozone between Eastern and Western species. In addition to his work on the flora project, Gentry has taken on another passion – blackberries. Gentry has spent hours in the prickly bramble patches, taking clippings of flowers, fruit and canes to characterize different varieties of these plants. It all started for Gentry with a virus, brought to his attention by plant pathologist Rose Gergerich in the Dale Bumpers College of Agricultural, Food and Life Sciences. Gergerich studies a recent problem that has developed in cultivated blackberries – the culprit appears to be virus that is transmitted from wild blackberry varieties, and it is killing the cultivated plants. Gergerich consulted with Gentry to see if they could determine the origins of the virus.”They need to know which blackberry species harbors the virus,” Gentry said. But as Gentry began looking at blackberry taxonomy, the only thing that became clear was that nothing was clear. Published literature contains contradictory statements about blackberry species in North America. The six-county area in Northwest Arkansas alone is home to 14 species of blackberries, Gentry said. Despite the fact that blackberries grow statewide, they have been sparsely and incompletely collected. “People don’t collect them because they’re difficult,” Gentry said. He has the scratches on his arms and the chigger bites on his legs to prove it. And besides the scrapes and bugs, collectors must collect both flowering and non-flowering stems of blackberries to make an accurate examination of the species, because different species of blackberries reproduce in several distinct ways. 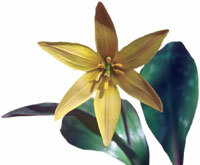 The researchers produced a set of county distribution maps and fact sheets for each species of cancer fighting plants. The process involved bringing together the records of all the state herbariums at the UA Herbarium. They then documented each plant, recording the date and location where it was collected, and reviewed existing ethno-botanical literature as well. Arkansas has six natural geologic divisions, each containing distinct plant communities: the Ozark plateau, the Arkansas River Valley, the Ouachita Mountains, the West Gulf Coastal Plain, the Mississippi Alluvial Plain, and Crowley’s Ridge. The researchers discovered that of the 248 anti-cancer plants found in Arkansas, several had exceptional cancer fighting potential. 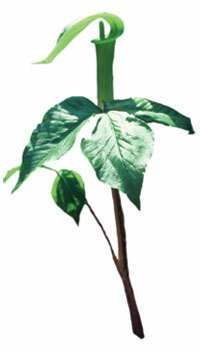 For example, the mayapple is a common plant in the state, flowering in the spring and forming umbrellas over waxy white single flowers. Its fruit is edible and can be made into jams and jellies. For centuries, American Indians used it as a purgative and de-wormer, and a resin from the plant was used to treat venereal warts. The mayapple, commonly found in Arkansas, may have chemotherapeutic properties that could be used in treating cancer. Another promising candidate is the pawpaw tree, whose creamy fruit is a highly sought after delicacy. The trees contain the compound acetogenin, which has proven an important anti-tumor agent. Common sneezeweed, extremely toxic to cattle and fish, contains a chemical that the National Cancer Institute has found to produce significant anti-tumor activity. Gentry found that 249 species from Arkansas’ 75 counties could be listed as cancer fighting plants. He became interested in identifying these plants when he found that no easily accessible information existed on them at all. The members of the Arkansas Flora Project have just completed a Checklist of the Vascular Plants of Arkansas.